(1981) What more can I write about Aamir Khan. He has starred in most of the hit films of the past decade ever since his debut in Qayamat Se Qayamat Tak . Another famous director, known for his movies with long names such as "Alert Pinto Ko Gussa Kyon Aata Hai", "Mohan Joshi Haazir Ho". Elder brother of Aziz Mirza. Channel V VJ who presents the programme Ghat Mania or was it Maangta Hai. Hrithik Roshan is also one of the hottest actors in Bollywood today. He rose to prominence with the hit movie 'Kaho Na Pyaar Hai' and then has had several hits such as 'Koi Mil Gaya', 'Lakshya', ' Krrish' etc. Hrithik was born on January 10th, 1974 and his nickname is Duggu. 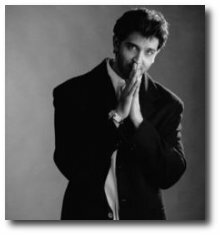 Hrithik's first movie role was as a child artist when he was six years old in the 1980 movie Aasha, when he appeared in a dance sequence as an extra. He went on to appear as a child artist in Aap Ki Deewane (1980) and Bhagwan Dada (1986). (1987) Another movie star. His debut film was Bekhudi with Kajol. (1988) Son of the santoor player Shiv Kumar Sharma He has performed and cut records. Shilpa Kapoor was a Television Model and has done over 100 adfilms, viz Hallmark cards, Horlicks Junior, Daewoo, Daewoo Matiz, Wills Yearbook, Kodak Cameras, Walls Icecream, Tirupati Oil, Rooh Afza, Hamdard Rogan Badam Shirin, Clinic Shampoo, Sunsilk Shampoo, Visa, Hawkins.. and many more. She is currently an architect and an interior designer practising in Mumbai. (1954) Snooker champion in the 50's and the 60's. daughter of the famous actress Mala Sinha. Has starred in a few movies. One of her popular appearances has been as the dancer in the song Pardesi, Pardesi in Raja Hindustani . Born to a family of exporters from Gujarat, Pia has been based in Mumbai all her life. She finished her schooling from Bombay Scottish and Junior College from Jai Hind in South Mumbai. In class 6; when most kids are glued to comics, cartoons and homework, she drew inspiration for modelling from her elder sister who had strutted down the ramp for a show at Tikujini Wadi, a water park at the out skirts of Mumbai. Enamoured by the overwhelming response and the unmatched attention her sister received at the show, Pia decided follow suit. Like a good mama€™s girl, she completed her studies for the next six years of her life, but never for a moment did she lose focus on her goal for modelling. In mid 2003, without anymore ado, Pia auditioned for ace choreographer Marc Robinson and the same year she waltzed up the runway at the Lakme India Fashion Week. From there on there was no looking back. On the personal front, she is a perfect daughter to her businessman father and homely mother. A strong camaraderie exists between the two sisters as they identify with similar fundamentals of life.